The Paris marathon had about 60,000 runners. Never seen anything like this. So many people in one place. Getting water was a nightmare. Let’s rewind to my arrival. I think I fit the profile of a peddler. The police checked my passport with a microscope kind of gadget. I was disappointed as I had gotten a last minute business class upgrade from my friend Amelia who has connections. So I thought I was too important for this kind of check. Next was the police at the exit who asked what I was doing in Paris, with glee I said I am here for the marathon. He then asked, “do you smoke?”. Dude, I just told you am here for the marathon, the two don’t go together, I thought. He then asked if I had carried food, I said no, its just spices but I did have pears. Yes, pears. When that phone call ordering for pears came in, I wondered, pairs of what? No, pears the fruit. Later in the day I decided to go pick my running bib and the goodies that come with it. I literally bumped into Edward when looking out for the Asics stand to tell me what kind of running foot I have so that I can buy their shoes. Clever marketing that we buy into. Edward is the latest Swara on the block. He is like the child who has just discovered candy. He just got the runners bug. It has swept him like voices in a hurricane. He even told me he does not sleep well as he is thinking of running. Edward don’t shoot me. Luck has it that he got picked in the New York lottery. I keep praying a miracle will happen as I tried so hard for this one. Edward then took me to the Kenyan stand in the running expo. Yes, Kenya was in the expo at the back where you never reach in an expo. The stand was nothing to write home about. A big banner of Kenya Airways and little writing on it about Maasai Mara marathon. Really! I decided to keep my marketing knowledge to myself. I might upset someone’s hard work. I had told Edward that we must do the 5 Kms breakfast run on Saturday. We met during the run at 2.5kms. We then jogged together planning our race for the next day. I was afraid that as I run with my country flag I was putting myself at a pedestal that I cannot reach. I was glad when a parent from Scotland asked if we could give him the Kenyan flags for his son who is looking forward to the commonwealth games in Glasgow and wants to cheer the Kenyans. Phew! There was a dj in a tuk tuk like van speaking in French. I was reacting to the yeeeee yeeeee calls five seconds late as I was not understanding his hype call on time. I think he is a hot DJ in Paris as the ladies were screaming hard. The run ended at the Eiffel tower. Indeed this tower is beautiful. Built in 1887, 324 meters tall and made of iron, it was made as a centerpiece to celebrate the French Revolution. Breakfast was served; coffee, a real croissant (forget the oily Nairobi ones), banana and water. We sat and discussed Malaysian airline and how I thought I was finished every time turbulence happened. On the morning of the run I decided to wear the plastic polythene jacket that they put in the goodies bag. It was cold. I met Joelle a girl from Philippines at the start line. Our names rhyme, I thought. We talked about Eldoret, Mo Farrah’s fall and training in the Manila heat. I was glad I didn’t live in Manila. She had issues on the left leg, calf pain and ankle and something else. She reminded me about my ankle. I wasn’t too excited given I had sprained my ankle a week before. The run started on time after some warm ups that I thought would rob me off some running energy. Everything was beautiful. The ancient buildings, the people, the excited children, camera men who said smile in French. The key cheering word in French speaking countries is “courage” meaning strong. I heard this word for the first time at Kigali marathon and Nadine translated at the end of the run. This time round I knew it. Getting to 20 Kms was a breeze. At 27 Kms things ceased to be beautiful. My ankle was hot but I was still moving. Moving is good at this point. My brain was loosing network, for real, I had a blank phase from 32 upto 35 Kms. Maybe I was praying. Maybe I was having a conversation with my ankle. At 37 Kms an old strong man came to urge me on. I finally thought, just the motivation I needed. He waited for me at the finish line. He talked a little English, but at least we communicated. He told me, “it is obligatory to drink the Powerade”. Obligatory! Must be some translation from French. It is a big word but I got the point. I then sat for 20 minutes imagining that this is what Ndichu was feeling after Naivasha relay. Where is he? As I was recovering, the old man took this moment to share his feelings. He told me in broken English that he wanted to sleep with a beautiful girl. I wondered, if he was referring to someone else or me. My network was not yet totally together so I thought it’s not me. I was missing Lucy, she is my 12 years a slave. Gets me what I need at such recovery moments. He then said that in the evening I should drink a beer, I said no, I do wine. I said goodbye to him and headed home. Europe has a way of making you walk a lot. You walk to the train station, to the house, to the mall, to everywhere. You walk. Walking home was not easy. From the train station to my Paris residence is 1.2kms. It seemed far. They had given us a green polythene to wear after the run so I got saved from the cold. This is the longest walk I have experienced. Even Mt Kilimanjaro was easy. I felt like my left ankle should be cut off. On my! I then remembered the dark tunnels in the run. There was even a band playing in one of them and there were disco lights. So much for experience. I truly didn’t like them. Then I smiled, it could not get worse. I finished in 3.50. At the start, Joelle had told me that 20% of the people who start Paris marathon do not finish. I prayed that I would be in the 80%. I also read that only 20% of the runners are female. I knew it was a good place to be in. My finishing number was 11,745 out of about 60,000 runners. Next. I wrap up my road races this year in New York in 3hrs 13mins 41secs. Indeed it has been a colourful running year for me and couldn’t have asked for more. 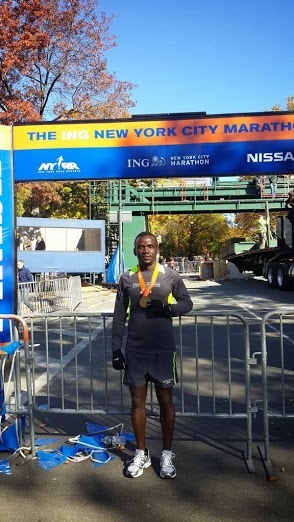 Coming in the backdrop of a personal best in Chicago marathon 3 weeks ago, New York marathon was always going to be a big gamble and I am over the moon to have finished in a decent time without an injury. But boy, my body is hurting! The course has its fair share of inclines especially over six landmark bridges with a good number of turns and twists hence not a fast one. But I bet it’s the very cold weather (between 1 & 2 degrees Celsius) and the heavy winds ( 20 miles an hour headwinds) that did the damage even for the champs. But Kenya still rules the world of marathons and I had my moments in the sun running with the greats in the game. Regardless, a sublime city to run passing by iconic landmarks with lovely crowds and music all the way except over the bridges where there is suddenly deafening silence and you can’t help but feel the rhythm of thousands of vibrating feet. My runners high was crossing Queensboro bridge, one of the quietest spots, into Manhattan where a fanatical vocal crowd was waiting with Frank Sinatra’s “New York New York” playing in the background. What a feeling, I got goose pimples from the wild cheers and it’s right there that I knew I was going to finish the race one way or another. For me, I bet there is no better and unique way of exploring New York City but by running through its five boroughs; Staten Island, Brooklyn, Queens, Bronx, and Manhattan. Apart from being honoured to carry the Kenyan flag during the marathon weekend opening ceremony parade, one of my highlights of the race was meeting with Sydney; an Australian running for Toby’s recovery and Shoe4Africa. I was able to pick her out from the crowd just before the gun, because she was wrapped in a Kenyan flag and carrying placards with Toby’s name. We ran the first mile together and she was such an inspiration! We love you Toby and pray that soon you will be back on your feet doing great stuff. Three items off my marathon bucket list this year; Paris (the city of light), Chicago (the windy city) & New York (the city that never sleeps). Once again, I salute Urban Swaras running club for making me a marathon junkie! Special thanks to Nduku for the overwhelming support and advice through the year, you are one of a kind Tata! What does next year hold for me, you ask? I delight in not knowing. That’s one of the beauty of running, it’s full of surprises! What I know is that every additional mile I do just makes me dream bigger. Below is a link that captures my journey from Paris to New York.